My Thanksgiving meal is always a very traditional meal, just like my mother always made. My only concession to convenience is my smoked turkey. I purchase a pre-smoked turkey at the grocery store. The turkey is pre-cooked, and requires only thawing and reheating. 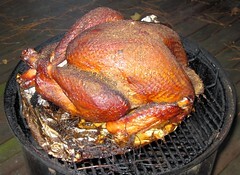 It is tender and moist, with wonderful smoked turkey flavor. It is so easy, and my family likes it so much, that we occasionally cook one for parties or busy weeks and freeze the leftovers. Without the long cooking time of a raw bird, turkey can be enjoyed anytime. The downside of this is that you don’t get the giblets, so you have to settle for regular turkey gravy. To cook, simply follow the reheating instructions on the package. Did you know that you can get the butcher to cut your turkey in half? If you have a small family and don’t need a lot of leftovers, have the butcher cut the (frozen) turkey in half lengthwise. Place one half in the freezer for a future meal and use half for your holiday meal. You can also have the turkey sliced in 3/4 inch slices crosswise for easy turkey nuggets. Thaw a slice, remove the bones, batter and fry for cheap and easy turkey nuggets. Even easier is to slice a turkey breast for boneless nuggets and turkey tenders. Stock up while prices are low.